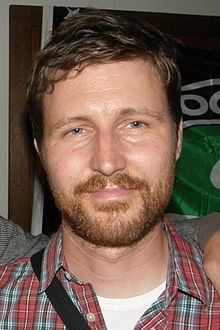 Andrew Haigh (/heɪɡ/; born 7 March 1973) is an English film and television director, screenwriter and producer. Haigh was born in Harrogate, North Yorkshire, England. After his parents separated, he attended a boarding school. He read History at Newcastle University. Haigh worked as an assistant editor on films such as Gladiator and Black Hawk Down before debuting as a writer/director with the short film Oil. In 2009 he directed his first feature-length film, Greek Pete, which debuted at the London Lesbian and Gay Film Festival. The film is set in London and centers on male prostitution, chronicling a year in the life of rent-boy Pete. Greek Pete won the Artistic Achievement Award at Outfest in 2009. Haigh's second feature, the highly acclaimed romantic drama Weekend about a 48-hour relationship between two men (played by Tom Cullen and Chris New), premiered on 11 March 2011 at the SXSW Film Festival, where it won the Audience Award for Emerging Visions. The film played in many other festivals around the world, and went on to collect many more awards including the Grand Jury Award for Outstanding International Narrative Feature at L.A. Outfest and London Film Critics' Circle award for Breakthrough British Filmmaker. Haigh's next film 45 Years premiered as part of the main competition at the 65th Berlin International Film Festival. The film won the top acting prizes at the festival for both its leads, Charlotte Rampling and Tom Courtenay. It was widely released in the UK on 28 August 2015, and was screened at the Telluride and Toronto film festivals in September 2015. The film later received an Academy Award nomination for Charlotte Rampling. Upon release, the film received positive reviews, holding a 97% rating on Rotten Tomatoes. Kate Taylor of The Globe and Mail wrote: "45 Years exposes the paradoxical balance of the successful marriage, one that requires a sentimental suspension of disbelief on the one hand and a hard-headed ability to deal with the everyday on the other." Haigh co-created, co-produced and occasionally wrote and directed the HBO drama series Looking (2014–2016), about a group of gay men in San Francisco, which struggled to attract audiences despite receiving generally positive reviews from critics. Cancelled after two seasons, the series finished with a two-hour TV movie in 2016. Haigh's next film, Lean on Pete, based on the Willy Vlautin novel about a teenage boy in Oregon, premiered at the 74th Venice International Film Festival in 2017. It was released in cinemas and on VOD in April-May 2018 and received critical acclaim. In October 2016, Haigh was announced as the writer-director of The North Water, a mini-series based on the novel of the same name by Ian McGuire. Filming is expected to start in Summer 2018. Haigh is married to author Andy Morwood. ^ Murphy, Mekado (31 December 2015). "Andrew Haigh Narrates a Scene From '45 Years'". The New York Times. Retrieved 7 April 2018. ^ Hughes, Sarah (19 January 2014). "Gay life in all its ordinariness: Director Andrew Haigh discusses his new HBO series". The Independent. ^ Kellaway, Kate (9 August 2015). "Andrew Haigh: 'It takes a kind of insane self-belief to go on'". The Guardian. ^ "London Lesbian and Gay Film Festival on Tour". The List. 9 July 2009. Retrieved 21 June 2012. ^ "Outfest 2011: Highlights of this year's festival". Reuters. 7 July 2011. Retrieved 21 June 2012. ^ "Weekend (2011)". Rotten Tomatoes. ^ "SXSW 2011: Andrew Haigh is an emerging talent destined to become the main event". The Guardian. 21 March 2011. Retrieved 21 June 2012. ^ ""Weekend," "Habana Muda" Among Top Outfest Winners". indieWire. 18 July 2011. Retrieved 21 June 2012. ^ "ANDREW HAIGH NABS BREAKTHROUGH FILM-MAKER AT LONDON CRITIC'S CIRCLE AWARDS". TheFanCarpet.com. 20 January 2012. Archived from the original on 25 December 2014. Retrieved 20 June 2012. ^ "Gay director Andrew Haigh talks about his memorable 'Weekend'" Archived 12 April 2013 at Archive.today. Wisconsin Gazette, 29 September 2011. ^ Brennan, Matt. "How HBO's 'Looking' Went from Boring to Brilliant | IndieWire". www.indiewire.com. Retrieved 21 August 2017. ^ "HBO should renew Looking, even though nobody watches". 9 March 2015. Retrieved 21 August 2017. ^ "Synopsis | Looking: The Movie | HBO". HBO. Retrieved 21 August 2017. ^ a b Carney, Brian T. (28 January 2016). "'Looking' ahead". Washington Blade. ^ "Lean on Pete (2018)". Rotten Tomatoes. Fandango Media. Retrieved 9 May 2018. ^ "Lean on Pete Reviews". Metacritic. CBS Interactive. Retrieved 10 April 2018. ^ a b Mitchell, Robert (17 October 2016). "Andrew Haigh Dives Into 'The North Water'". Variety. ^ "BBC Two announces Andrew Haigh to write and direct The North Water". BBC. 4 October 2017. Wikimedia Commons has media related to Andrew Haigh. This page was last edited on 30 March 2019, at 12:39 (UTC).